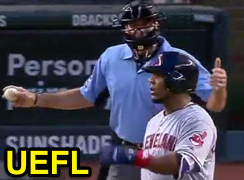 Edwin Encarnacion threw his bat and nearly hit HP Umpire Angel Hernandez after striking out care of a check swing call during Saturday's Indians-Diamondbacks game, which resulted not in ejection, but in Hernandez issuing an equipment violation. Encarnacion's had tried checking his swing on a Zach Greinke 3-2 slider, only to be rung up on appeal by 1B Umpire Lance Barksdale. Recall that on Thursday, plate umpire David Rackley ejected Dodgers CF Joc Pederson for throwing his equipment at home plate after a swinging strikeout. With both the Pederson and Encarnacion plays involving thrown lumber in seeming protest of an umpire's call, the question becomes why the former received an ejection while the latter did not. 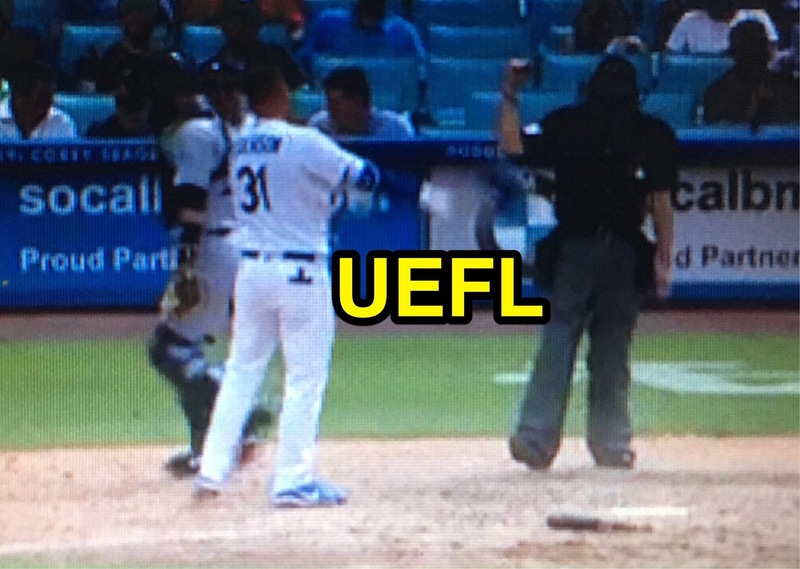 Replays of Encarnacion's reaction to Barksdale's call indicate clear frustration and disagreement with the ruling, as Encarnacion jumped and threw his arms up in protest, before hurling his bat in a reckless manner, where it nearly struck plate umpire Hernandez. There is little doubt that Encarnacion's actions were in response to Barksdale's call, though the tempered immediacy of Encarnacion's response prevented it from entering "histrionic gesture" territory. In the Pederson case, Joc slammed his bat and spiked his helmet on top of home plate in one seeming motion, but nonetheless threw two pieces of equipment to Encarnacion's one. While both players appeared to look directly at their respective umpires of ire while throwing the items, Pederson's ejection also owned the distinction of having only one umpire's call involved—Rackley—whom Pederson appeared to verbally address while committing the unsporting throwing act, and the calls Pederson disagreed with were strikes one and two, and not strike three. Encarnacion's actions were immediate and in response to the call directly preceding them. Heat-of-the-moment considerations were not applied to Pederson, since a full pitch transpired between the call-under-dispute and the unsporting act. Violation or Ejection? Depends on severity. Under the Standards for Removal guidelines we recently discussed, both players appeared to have thrown equipment in disgust over an umpire's call. The major difference is that Pederson's reaction made reference to a pitch that did not directly precede the protest whereas Encarnacion's did: Pederson argued strike two to Encarnacion's strike three. Thus, Pederson's actions violated the "Prolonged" element of the mythical three Ps (Personal, Profane, Prolonged), while Encarnacion's did not. Throwing equipment in disgust over an umpire’s call may be grounds for ejection. If the umpire deems the action severe, the umpire may eject the offender. If league regulations permit, the umpire may instead warn the offender by issuing an equipment violation. If issued, the offender is to be notified immediately. Pederson had already enjoyed a longer leash and protest window after called strikes one and two—the actual calls he disagreed with: continuing the argument by throwing his equipment after strike three was overkill. Reyes' bat toss was OK; his helmet wasn't. As the replay indicates, Encarnacion appears to calm down shortly after leaving the dirt circle and he tosses his batting helmet gently towards his dugout, as opposed to spiking it on home plate with force, or throwing it in the direction of an umpire (see Ted Barrett's ejection of Jose Reyes, which occurred only after Reyes left the dirt circle surrounding home plate and threw his helmet in Barrett's direction: immediately prior, Reyes had thrown his bat for an equipment violation). By contrast, Encarnacion's unsportsmanlike reaction was immediate, but not prolonged. Had he thrown his helmet with greater force or directed it in any other direction but his team's dugout, he likely would have been ejected. 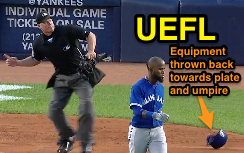 Accordingly, Pederson's more severe throwing-two-pieces-of-equipment-in-disgust action merited the more severe penalty of ejection, while Encarnacion's strong-yet-confined "heat of the moment" response was significant enough for an equipment violation (warning), but not severe enough for outright ejection.